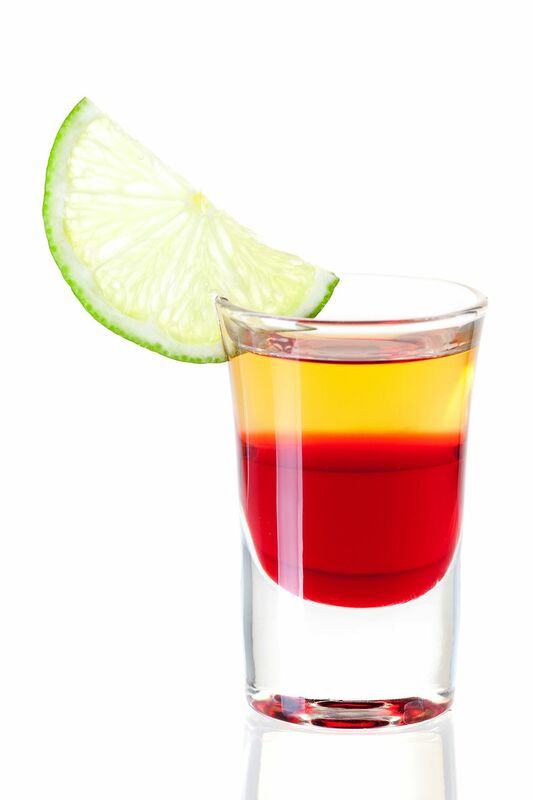 The Jelly Bean shot is a fun layered drink that has some interesting flavors which tend to taste like the candy it's named after. To be a bit more precise, this party shooter is more like a black Jelly Bean thanks to the anise-flavored liqueur used. The key to a great Jelly Bean is in the layers. The three liqueurs are poured on top of each other in the order listed with the heaviest on the bottom and the lightest on top. This creates a triple-layered shot drink that looks great in the glass and is fun to drink. If you have never layered a drink before, the Jelly Bean is a great place to begin. The ingredients have specific densities that are distinct enough to make the separation easy. This is especially true if you take your time and learn the proper technique for floating. Pour the brandy or grenadine into a shot glass. Float the sambuca or anisette on top of the first layer by pouring it over the back of a bar spoon. Float the Southern Comfort on top of the second layer, also using a spoon. The nice thing about the Jelly Bean recipe is that it gives you a couple of options for the ingredients. If you don't have, for instance, blackberry brandy, you can use the more common grenadine. Both have almost the same weight so the second layer will easily float on top. Blackberry brandy vs. Grenadine. The first layer in your Jelly Bean shot gives you the greatest option in flavor. You will choose between blackberry or pomegranate (sorry, real grenadine is not cherry-flavored) and this will impact the taste of the drink. Either option is fine, yet as already pointed out, grenadine is easier to find. You can also choose a blackberry liqueur as many brandies available in this flavor today are sweetened and very liqueur-like anyway. The point is that in this instance you do want the sugar because it adds to the weight of the liqueur. The heavier this bottom layer, the easier it will be to float the second on top of it. Anisette vs. Sambuca. Both anisette and sambuca are anise-flavored liqueurs and this is the layer that gives the Jelly Bean its black licorice-like flavor. Don't worry if you're not a fan of the individual taste because the shot's other ingredients do a fair job of combating that and it's actually quite nice. Anisette is a clear-colored liqueur while sambuca comes in a variety of colors. You might find bottles of sambuca in green, red, gold, or white (actually clear) and it's a fun way to add color to that middle layer. Southern Comfort. Southern Comfort is a liqueur and not a whiskey, though it's almost as light as whiskey, which is why it's a perfect top layer for the Jelly Bean. Then again, you can always use whiskey instead if you really do not want to buy a bottle of SoCo. The fruity flavor of Southern Comfort does add to the Jelly Bean's taste. The apricot-peach taste acts as a sort of bridge between the sweeter bottom and the herbal middle. Because it hits your mouth first, it almost prepares your tongue for the anise that follows. How Strong Is the Jelly Bean? Just to get an idea of the alcohol content in a Jelly Bean shooter, let's compare two options for building this drink. Of course, these are just estimates based on the average alcohol content for each liqueur and it will vary depending on the brands you choose. As you can see, there is very little difference between the two drinks. That is because, despite using a non-alcoholic grenadine, sambuca is often twice as strong as anisette. Also, neither drink is what we'd call 'light' because it is not shaken and therefore the alcohol is not diluted with water.